Consider fallowing scenario that you have SQL Server 2008 R2 RBS enabled, and SharePoint Server 2010 RBS installed servers . You have some files that stored in SharePoint document library whichs streams are stored in RBS and even you deleted this files form SharePoint Document Library you noticed that the Blob data in file system still remaining. Usually this is not a problem it is by design issue , because purpose of data recovery ,performance consideration, data integrity and safety the deleted files in real are not deleted immediately. So many systems are designed like this as SharePoint and also RBS included. In that kind of systems as a manner of being on the safe side they are just mark the files are deleted and than runs some background process later for deleting files according when some thresholds or limits are exceeded. If you what to find out this issue is a real problem you have to disable or make shut down this functionalities and after doing this still the blob files are remain on file system then you can say that you have a real problem. On SharePoint side First thing you should check that the feature of Recycle Bin. 2) or when you delete a file you can clear Site (First-stage) and Site Collection (Second-Stage) Recycle bins. On SQL side in Content Database if you want to be sure and confirm deletion of the file you can use fallowing SQL . *** You can find List Guid on Browser Address bar when you open Library Settings page of a document libarary. and check results for the file still is exists in that list .If you clear correct there should not be the related file is present on the results. “SharePoint Server 2010 automatically marks unreferenced or deleted BLOB data for removal. SharePoint Server 2010 counts references to BLOBs by looking at the list of BLOB IDs stored by SharePoint Server 2010 in its content databases at the time of removal. Any BLOB references that are present in the RBS store tables but absent in the content database are assumed to be deleted by SharePoint Server 2010 and will be marked for removal. BLOBs that are not present in the content database and were created before the orphan cleanup time window, described later in this article, are also assumed to be deleted by SharePoint Server 2010 and will be marked for removal. Because SharePoint Server 2010 tabulates BLOB references from the RBS columns of the content database, every RBS column must have a valid index before it can be registered in RBS. The SQL Server RBS Maintainer tool removes the items marked by SharePoint Server 2010 for removal. You should schedule the clean-up tasks to be run during off-peak hours to reduce the effect on regular database operations. Reference scan. (RC) The first step compares the contents of the RBS tables in the SharePoint Server 2010 content database with RBS’s own internal tables and determines which BLOBs are no longer referenced. Any unreferenced BLOBs are marked for deletion. Delete propagation. (DP) The next step determines which BLOBs have been marked for deletion for a period of time longer than the garbage_collection_time_window value and deletes them from the BLOB store. We have talked about ThreshHolds . In RBS configuration we have 3 important threshold for clearing BLOB data. garbage_collection_time_window : Specifies the minimum time that must pass between identifying a blob as having no references in the database and deleting the blob from the store. 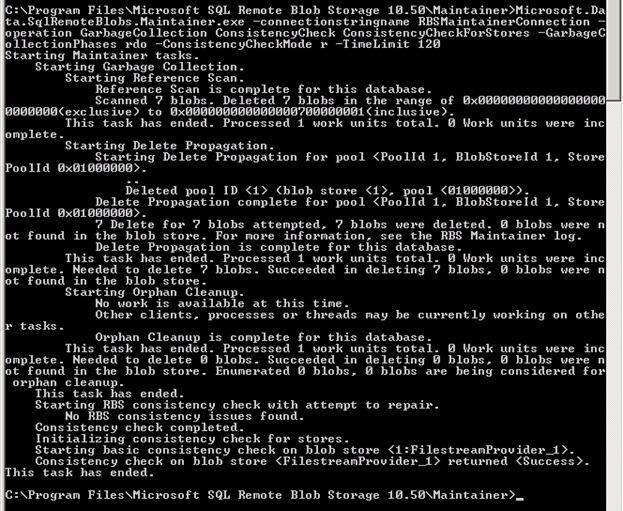 This guarantees the availability of BLOBs for the specified time in case a backup is restored. The default value is 30 days. So according to default values , your BLOB files should be cleared after 30 days , if they are not referenced to any Content Database record. “The actual work of GC is done by the RBS Maintainer application. The maintainer is a console application that takes command line parameters such as the connection string to the database and the phases of GC to execute. This can be run from any machine that has access to the DB and the blob store(s). It can also be run from multiple machines simultaneously. You can schedule it using your favorite scheduler e.g. Windows Task Scheduler. RBS requires you to define a connection string to each database that uses RBS before you run the RBS Maintainer. This string is stored in a configuration file in the <RBS installation path>\Microsoft SQL Remote Blob Storage 10.50\Maintainer folder that is ordinarily created during installation. The RBS Maintainer can be run manually by executing the Microsoft.Data.SqlRemoteBlobs.Maintainer.exe program together with the parameters that are listed in the following table. After you run RBS Maintainer , RS and DP phase completed the blob records will be cleared ! no not yet 🙂 . This operation is takes much 2 or 3 mintues and depends on how much data you have.